HSC Result Rescrutiny 2018. HSC Board Challenge Re-Check Re-monitoring Result 2018. HSC Result 2018 start from 2nd August 2018 and it will continued upto september 2018. HSC Result 2018 had published recently. But There is a matter of great regret that, this result would be incidental to anyone. So what don’t worry, you would be go to Re-monitoring your HSC Exam 2018 all subjects. Someone know it Board Challenge. Someone know it Rescrutiny and Re-check Exam result. How many subject for you want to apply Re-monitoring it’s depends upon your result and your wish. If your confident, you would get better result or marks then you can go to for Board Challenge. HSC Result 2018 Rescrutiny have only one method. 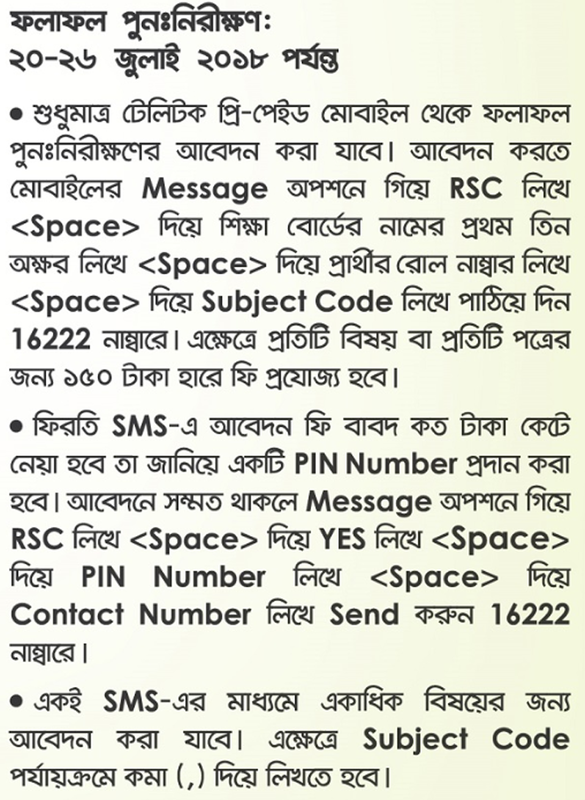 HSC Result 2018 Rescrutiny apply by SMS. You must be apply by Teletalk SIM. For per subject you must pay 125Tk, which is non-refundable. For Bangla and English Subject you must be pay 250Tk, which is non-refundable. Please follow the method below. There is a limited time to apply HSC Result Rescrutiny 2018. Application is start from 24th July and it will be deadline on 30th July 2018. Fill up each messages with carefully. Give your Contact number which is 24 hours available. Show and read your inbox regularly. Otherwise you must be fail HSC Result Resrrutiny 2017.